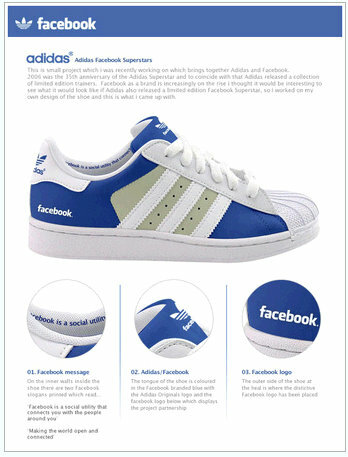 Facebook & Twitter Sneakers By Adidas... Really? 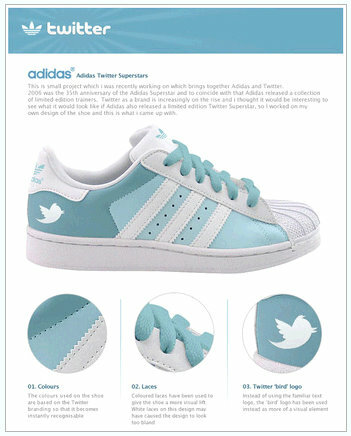 Facebook & Twitter Sneakers By Adidas… Really? If you’ve been wondering what to buy that special someone for Christmas, here’s a couple of things to consider (actually not really because these items don’t really exist… yet that is). How about a pair of Facebook or Twitter sneakers? Like I said though, these baby’s aren’t yet in production and are only concepts at this point. But with the amount of blogging that’s taking place over these sneakers, I can’t imagine it being much longer before we’ll see them on someone’s shelves, or someone’s website.